Is Honesty the best principle anymore? 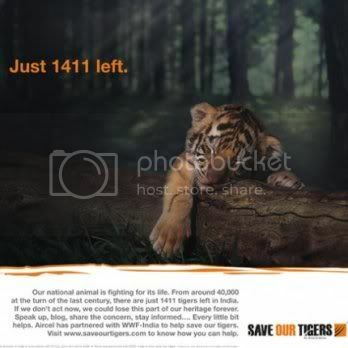 Sometime back, there was a high decibel campaign unleashed jointly by Aircel & WWF-India called ‘Save our Tigers‘ . The glitzy campaign, replete with TV spots of M.S. Dhoni, Baichung Bhutia, Kiran Bedi et al. & large hoardings sought to highlight the plea of depleting Tiger reserves and the dwindling number of Tigers in our country. Even the Prime Minister himself sent individual letters around the same time to all the Chief Minsters sensitizing them of the need to save Tigers. During the campaign though, I was constantly reminded of another species that is fast becoming extinct in our country – the Honest Man. No, I am not just talking about politics and I don’t just mean figuratively. We are quite literally running out of honest men (and women). If you don’t believe me, try answering these two questions truthfully: a) How many truly honest men do you know personally? Isn’t your answer in low single digits. Even among our natural sanctuary of friends, family, teachers, doctors etc. it is difficult to find too many people who are truly honest. b) What comes to your mind when you think of those honest individuals – aren’t they invariably old fashioned,out of touch with reality, tad eccentric, insufferable fools etc. Slowly but surely our society is becoming less and less conducive for honest individuals (recall Corruption unveiled). Look at any government department – an honest man can be easily recognised as the one who is economically constrained, has the least number of ‘hangers on’, has had most number of transfers, and whose own colleagues don’t get along too well with him. Similar situation exists even in many private organisations too. If the default is not ‘dis-honesty’ yet it has certainly changed to ‘flexibility’. Inflexible adherence to principles is already a thing of the past. The reasons for this are not too hard to find. More and more young ones today carry the weight of their parents’ and their families’ expectations. Cut throat competition at every level means that the straightest path is not the surest path to success. With all the emphasis on success, there is hardly any talk of morality and honesty. In such a pressure cooker environment means quickly become unimportant – donations, bribery, cheating, recommendations, falsification – anything goes, to reach the goal. Once there, one has then the obligation to pay back. This creates a vicious circle that is impossible to break. Overall the societal values have undergone basic transformation . There is less and less pride in being Honest and less successful than in being Successful and less honest. In all walks of life, whether one is looking for a life partner, a friend or a guide, honesty is not a very sought after virtue. Numerous other qualities take precedence, with wealth and comfort occupying the center stage. Even within families, expectations now gravitate more towards wealth and comfort. There is lesser stigma of ‘ill gotten wealth’ as long as it can ensure an easy life. The fundamental question we face today is whether we should raise our children to live by the same values that we espoused earlier with all its impending consequences. Are we not then, raising them as misfits in a society which increasingly values success more than rectitude, net worth more than integrity. These are important questions and we can hardly turn to any moral authority for guidance. The leaders of our nation have their hands full with multifarious problems that beset our nation and they are hardly in a position to provide any moral leadership. Ultimately the responsibility rests on all of us. Environmental concerns are of utmost importance but we also need to keep an eye on our moral values as we go along. With honesty becoming extinct at an alarming rate, time is not far off when an Honest Man (just like a Tiger) would only be found in books – “Once upon a time there lived an honest man. His name was…..” . Lets spend time and ponder over this as it could mean a lot for our Children. hi sanjay, i agree wholeheartedly that corruption is on the rise and honesty is becoming less and less fashionable, but i dont think this is a recent phenomenon, i think we as a civillization have always been ok with the end justifying the means. I completely agree with you my friend, we all are running after materialistic things without thinking about our end goals. Please join Young India Association and let’s create a new and honest India. @Ranjan Sending Emails to MLAs may not do the job. First of all we need to organize ourselves in a group, only then will we be in a position to influence any decision makers. Plz Join-us using the link on the menu. Root cause of corruption and degradation of moral rectitude is selfishness or self aggrandisement added with lttle bit of insecurity. Lets us remind ourselves that we born empty handed and shall die empty handed. Therefore be content and selfless. As an Australian I feel compelled to advise that corruption is not just an issue in India. 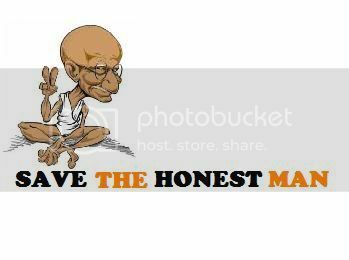 The death of the honest man is one of the major reasons the West is now as screwed up as it is.. The old stereotype of the rugged honest hardworking man who respected himself and others is now mainly a character in stories.. Over here it is also the wierd misfits who seem to be honest now, but could you honestly say you would raise your profile children as anything but honest?. No, because it just isn’t right. And that is more important right?. You may be right about the falling standards in the west, yet the levels of corruption and accountability are still very different here. About raising our children with our values, sure we will still try doing it, but we would lack conviction. The doubts in our minds about having failed to keep pace with the rest of the environment will surely be picked up by our children and ultimately they would make their own decisions. Impressed with ur post. All I used to think alone are put in words thru this post. I salute Honest people, endangered species nowadays & it is one of my life mission to save them, as this species can make lives of our future generations as safe. Whistle blower act need to be implemented in India. Once again I salute Honest Men as they are real heroes, rest are ordinary people like us. I admire your view and courage to speak truth.